The Dagens Nyheter, one of Sweden’s leading newspapers is chased by Israel Hasbara brigade for exposing the anti-Muslim bond between President-elect Donald Trump, and the serial liar Benjamin Netanyahu. 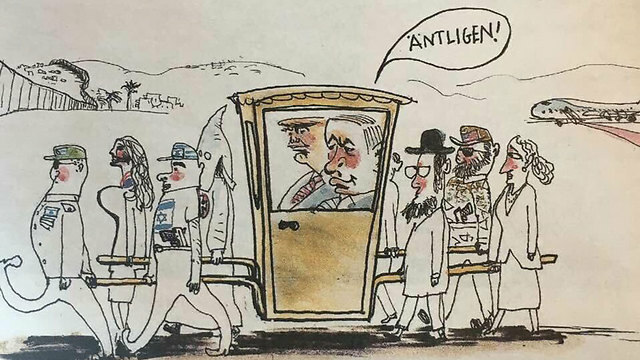 On November 20, 2016, the paper published a cartoon (below) showing Donald Trump and Benjamin Netanyahu sitting in carriage carried by Zionist Jews, Christians, and KKK … saying Antligen (Finally). Annika Hernroth-Rothstein, an Israeli journalist was the first to spot the cartoon showing Swedish hatred toward the peace-loving Israeli Jews. She posted the cartoon on her Twitter account on November 20 – and bang …. it became a celebrity. The Dagens Nyheter editor-in-chief Peter Volodarski (Jewish), however said that the cartoon was not antisemitic because it attacked the Zionist regime and not the Jews. On December 1, 2016 Israeli-Swedish film-maker Oriel Danielson explained Antligen (Finally) at The Jewish Daily Forward. “Finally, it implies, Netanyahu got the United States president he wanted, carried by evil Orthodox Jews, KKK supporters, Americans, and Israel supporters. He can now finally proceed with his vicious plan,” Danielson said. Frankly, I couldn’t have said better myself. Israeli ambassador Isaac Bachman demanded an apology from the newspaper. “Netanyahu is probably happy a Republican won. He has been wishing and hoping to see a Republican president for years. It is the first time in his almost 10 years as Prime Minister of Israel that a Republican will be the President of the United States. And Trump (and Pence) has already clearly expressed support for Netanyahu’s agenda. There is no doubt that the Israeli right is celebrating Trump’s win. But there is a huge step from there to implying that the Jews and the KKK are working side by side in a worldwide conspiracy to rule the world,” Laura E. Adkins, editor The Jewish Daily Forward claimed on November 9, 2016. She is a liar like Netanyahu. The anti-Black racist group KKK was indeed funded by Zionist Jews and some of them even held senior positions in the organization.